Light, powerful and packed with trickle-down MotoGP technology and refined fuel injection, the YZF-R1 is the most advanced Open-class production motorcycle ever built. Light, powerful and packed with trickle-down MotoGP technology, the YZF-R1 is the most advanced Open-class production motorcycle ever built. 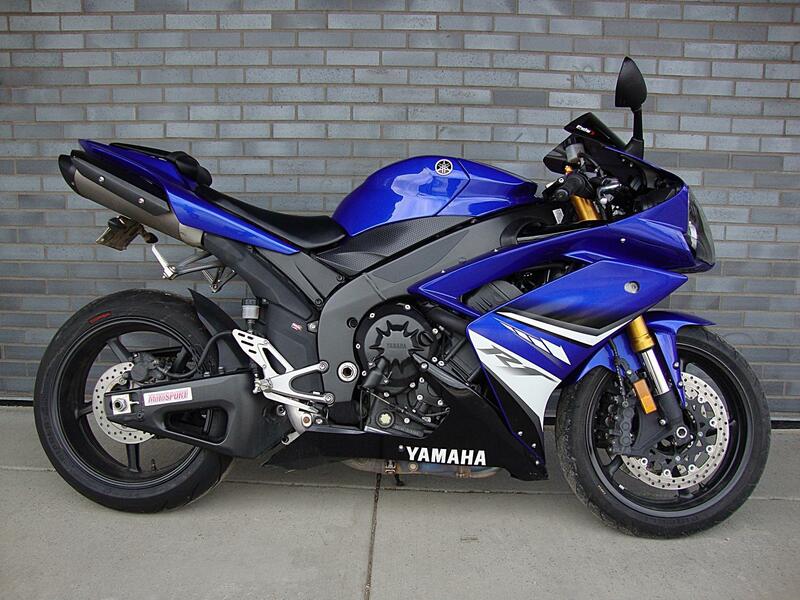 The YZF-R1 uses the YCC-T fly-by-wire throttle system for flawless response under all conditions. Inline four-cylinder engine is the most powerful, tractable R1 powerplant ever, thanks partially to the world's first electronic variable-length intake funnel system. Slipper-type back torque-limiting clutch greatly facilitates braking/downshifting from high speed. Aluminum Deltabox frame and swingarm take Open-class handling to the next performance level. Six-piston radial-mount front brake calipers and 310mm discs generate the kind of braking power a bike like the R1 requires. Short-stroke 998cc DOHC, 16-valve, liquid-cooled inline four-cylinder engine produces more tractable power than ever. Yamaha Chip Control Throttle controls a 32-bit ECU fuel injection system for super-responsive, smooth, instantaneous power delivery. Yamaha Chip Control Intake electronically adjusts intake funnel length between either 65 or 140mm for an amazingly broad, smooth powerband. Two-piece ergonomically designed fuel tank carries fuel in the rear section, for good centralization of mass, while the front half contains a Ram-Air-fed airbox for increased power. Lay-down-design cylinder head optimizes weight distribution, straightens intake tracts for improved cylinder filling and allows frame to pass over instead of around the engine for great strength and a narrow chassis. Closed-deck cylinder block increases strength and allows a narrow engine in spite of big, 77mm bores. Narrow-angle four-valve combustion chambers produce a highly efficient 12.7:1 compression ratio; 31mm titanium intake valves and 25mm exhausts controlled by new, high-lift cams flow plenty of air. Light and strong nutless connecting rods with fractured big ends produce a quick-revving engine with excellent high-rpm durability. High silicon-content ceramic-composite cylinder sleeves ensure great heat dissipation for consistent power delivery and reduced friction. Close-ratio six-speed gearbox with triangulated shaft layout for great strength, compactness, and quicker acceleration. Ramp-type slipper clutch makes braking from speed into tight corners while downshifting smoother and therefore faster. Titanium underseat exhaust system (with stainless steel midpipe and catalyst) provides excellent cornering clearance and a broad, seamless powerband. 13-percent greater radiator capacity and an aluminum liquid-cooled oil cooler maintain stable operating temperature. Direct ignition coils, dual-electrode spark plugs and high-output magneto deliver extremely accurate, reliable firing. AC generator behind cylinder block produces a narrow engine with excellent cornering clearance. A Deltabox frame tuned for optimal flex carries the lay-down four-cylinder stressed-member style for great handling and efficient aerodynamic penetration. A truss-type swingarm is extremely strong and tuned for optimal traction and feedback. Dual 310mm front disc brakes; new, six-piston radial-mount calipers and Brembo radial-pump front master cylinder with adjustable lever deliver amazing braking power and feel. Fully adjustable KYB inverted telescopic front fork with 43mm tubes has been revalved to complement other chassis changes. Piggyback rear shock now offers both high- and low-speed compression adjustability, rebound damping and a new, twist-style spring preload adjuster. Light, five-spoke wheels enhance acceleration, deceleration, handling and suspension action. Cool headlights provide great illumination and distinctive style, while the LED taillight is light, bright and highly efficient. Adjustable LCD illumination and multifunction digital gauges: adjustable shift light, odometer, dual tripmeters, water temperature, air temperature, full-time clock, lap timer and large 15,000-rpm analog tachometer. A fairing with big Ram-Air intakes and screwless windscreen provides maximum aerodynamic efficiency and engine performance. Sticky 120/70-ZR17 and 190/50-ZR17 radial tires for incredible grip and precise handling. Forged footpegs are extra durable and light. Extensive use of hollow bolts and lightweight fasteners helps trim overall weight. 8.6 AH battery is compact and light. Durable #530 O-ring–sealed drive chain. 43 mm inverted fork; fully adjustable; Travel: 4.7 in. Single shock w/piggyback reservoir; 4-way adjustable; Travel: 5.1 in.